We are all familiar many reasons for transitioning from gasoline and diesel in the transportation sector to alternative power sources – the environment, national security, and economy to name three. Greenhouse gas emissions controls are expected to go into effect in the near future in the US and there are very few options conventional engine manufacturers have for lowering GHG emissions other than making more efficient engines – an effort which is becoming more and more difficult. Natural gas has lower GHG emissions than diesel or gasoline at the same efficiencies so it can be a solution to meeting these upcoming federal regulations. The relatively recent unlocking of massive amounts of natural gas reserves gives us a compelling candidate fuel. Adding to the advantages above, the massive domestic supplies of this fuel mean it is much cheaper, giving it potential to reduce shipping costs and therefore reducing costs of all sorts of goods people rely on. But it is not without challenges. Compressed natural gas (CNG) is limited in range because you cannot store a lot of fuel on board a vehicle. LNG allows for greater range, but it must be kept in cryogenic tanks. If the fuel is not used quickly and warms up too much, some must be vented to the atmosphere which is bad for the pocket book as well as the environment. This characteristic makes it a difficult choice for regular passenger vehicles which may sit in a garage for several days without being used, but it is an excellent choice for trucking when one can be certain that the vehicle will be on the road every day and is responsible for 15% of our use of oil and 75% of the oil we import. There is already some serious effort going in to increasing the size of the national LNG fleet. Cummins Westport is offering an ever-wider selection of high quality engines. With the support of natural gas super-promoter Boone Pickens, Clean Energy Fuels is building out a network of LNG fueling stations – a key prerequisite to making more LNG trucking a reality. The low cost of the fuel makes it very attractive as a method of lowering shipping costs, but it comes at the price of higher up-front costs. The engines and fuel tanks are expensive, causing trucks to cost approximately $100,000 more than diesel trucks. This is a significant hurdle. The New York Times recently published an interesting article on this subject. As I outlined in an earlier post, the CCI engine has an inherent advantage to the natural gas engines available today. 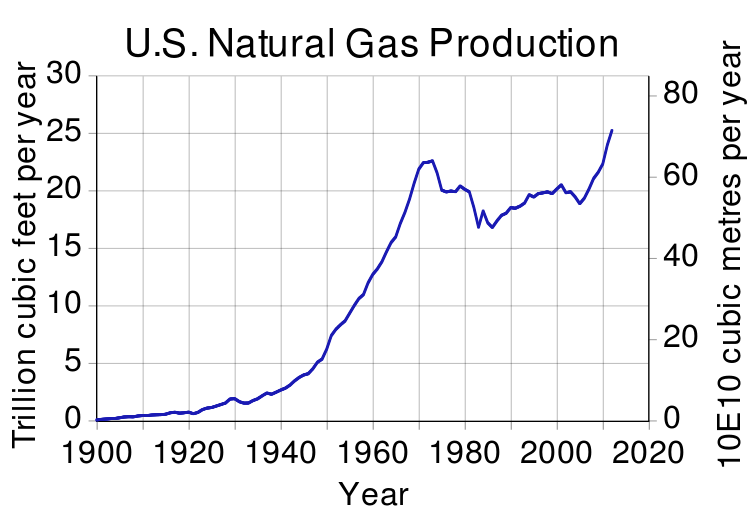 Prices may have moved a bit since that post, but the cost advantages remain very compelling. To recap, a conventional spark-ignited LNG engine has a brake thermal efficiency of around 27% whereas we expect that we will be able to build a CCI engine burning LNG with a brake thermal efficiency in excess of 50%. Therefore operating a diesel truck costs $0.18 per horsepower hour, a spark-ignited LNG engine $0.14 and a CCI engine $0.07. In addition, an analysis on full-production costs of the CCI engine performed by Caterpillar Inc. when the technology was still under their umbrella put it in line roughly with diesel engines, lowering the up-front price required for a fleet to purchase a natural gas truck. The CCI engine used in a LNG truck can make a huge impact on the costs of operating a truck fleet and therefore the costs of almost all goods transported in the US. It can significantly reduce the risk we face with our reliance on foreign sources of energy and it can provide a method of reducing greenhouse gas emissions on an economically beneficial basis. 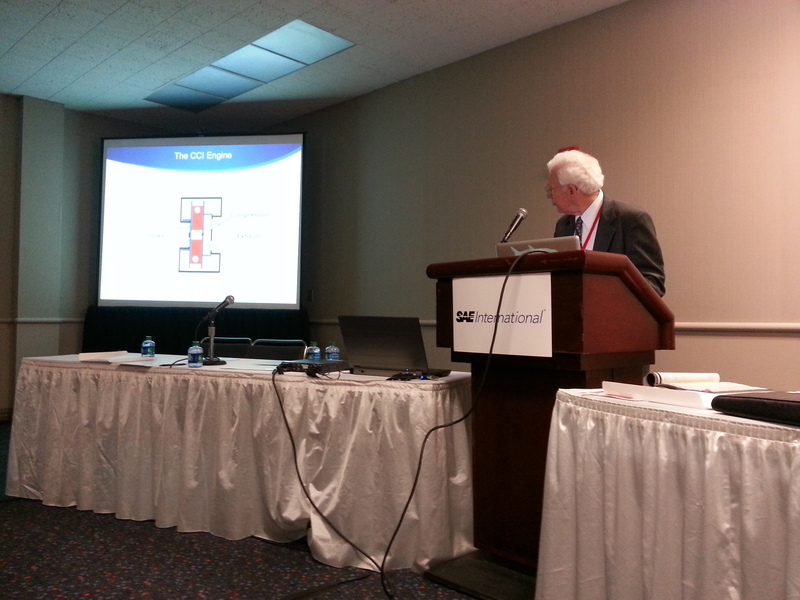 Last week we were in Detroit and John made the first public presentation on the CCI engine at the SAE World Congress. He did an excellent job and I feel that even though I am biased, it was one of the best presentations in the session. The other notably good presentation of the session was by Mahle on piston ring pack design. John: I love Stanford students because they actually know thermodynamics. Stanford Student: Oh gosh, thanks! I was just so glad to hear a presenter who actually knows what exergy is! SAE, we look forward to coming back next year and presenting the progress we’ll make over the coming year! The presentation is Wednesday, April 17th, at 2:20pm in room W2-68. Here is a link to our session schedule. I hope to see many of you there!